Distinguish from the thickness, the aluminum foil can be divided into thick foil, single zero foil and double zero foil. 1. Thick foil (heavy gauge foil): aluminum foil with thickness of 0.1 to 0.2 mm. 2. Single zero foil (medium gauge foil): aluminum foil with thickness no higher than 0.1mm. 3.Double zero foil(double light foil):aluminum foil with thickness in mm units of measurement has two zero after the decimal point, usually less than 0.01 mm, 0.005 ~ 0.009mm. Distinguish from the shape, aluminum foil can be divided into roll aluminum foil and sheet aluminum foil. Most of the deep processing of aluminum foil was rolled supply, only a small number of handicraft packaging occasions with sheet aluminum foil. According to the state, aluminum foil can be divided into hard foil, semi-hard foil and soft foil. 1. 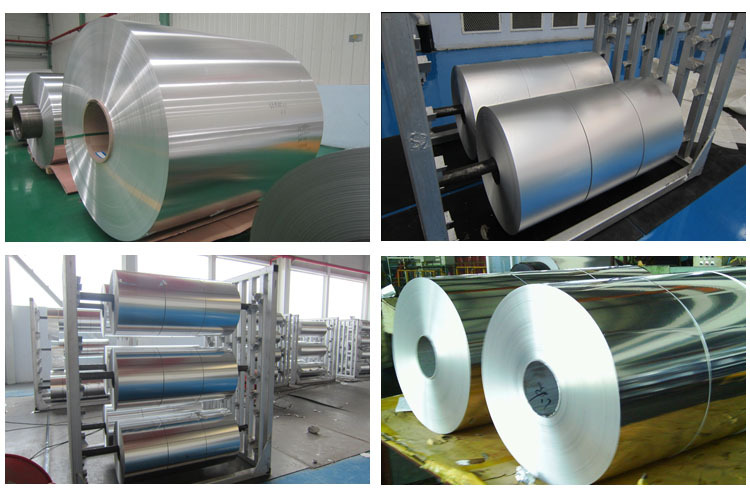 The hard foil: aluminum foil after rolling and without softening (annealing), without degrease treatment, the surface of the cloth is poor. So the hard foil must have degrease treatment before printing, bonding, coating, it can be used directly if used for forming. 2. The semi-hard foil: aluminum foil which has hardness (or strength) between the hard foil and soft foil, usually used for forming processing. 3. The soft foil: the aluminum foil after rolling and soften through full annealing, soft material, the surface without residual oil. Most applications such as packaging, composite, electrical materials, etc.